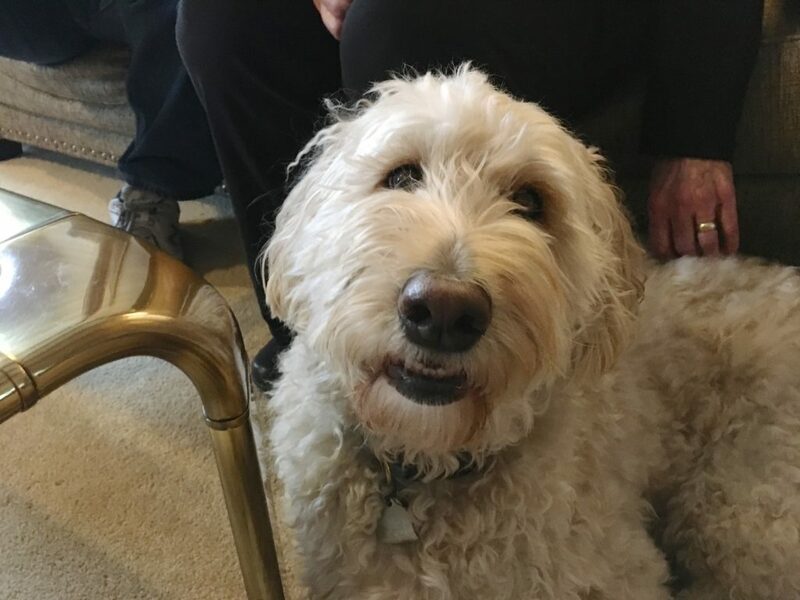 Annie is a two-year-old female Goldendoodle living in Omaha. Her guardians asked me to help with a couple of common puppy obedience and behavior issues; getting over excited at the front door, jumping up, counter surfing and not coming when called. While there were a number of dog behavior problems going on, I knew that the primary issue her family wanted me to do was train dog to come on command. Fortunately, Im a dog behaviorist who also does some dog training work on occasion. Annie showed good confidence and a pretty normal puppy playfulness when I arrived for the session. She invaded my space, was a little nosey and I did need to correct her a few times from jumping up; but all in all she did pretty well. I chucked a bit at first when her guardians started describing one of the things they wanted help with; counter surfing. Now dogs jumping up on the counter is fairly common, but when the humans told me about the time she grabbed a knife off the counter then chased them around the house. While this sounds like something out of a Home Alone movie, it could also be highly dangerous. I went over one of the dog training secrets I learned to stop dogs from getting up on the counter. It involves creating a situation that startles the dog when it tries to take something off the counter. One of my clients was kind enough to share a video she took of her using this technique to stop her own dog from the same counter surfing behavior. Because the dog triggers the commotion themselves and the timing is perfect, this usually stops most dogs from jumping up on the counters. In some cases, a few experiences like this may be needed with a different lure. Now there are other ways to teach a dog to stay off the counter using dog psychology and positive reinforcement, but the time required is considerably greater than this negative consequence. After making sure that Annie wasn’t likely to stab her guardians after counter surfing, we were ready to address the main issue I was contacted to help with, training a dog to come. I pulled out some high value treats and handed them out before spending a few minutes going over the basics to training a dog to come on command. By practicing the come with Annie, her guardians will help her develop the skill to respond when called in the future. It will take a little practice with progressive increases in distance and locations, but Annie should start coming on command. By the end of the session, Annie was noticeably calm,er was showing respect for personal space, coming when called and even staying away from the door when we practiced guests arriving. By enforcing rules and providing structure, Annie’s guardians should be able to help her get past these unwanted behaviors. Introduce and enforce rules to help Annie start seeing herself as being in the follower position. Pet Annie with a purpose. Increase daily exercise, especially early in the day. Look into dog day care or play dates to drain energy and ensure socialization. Use escalating consequences to disagree with unwanted behavior and enforce rules. Get into a habit of claiming personal space when Annie gets too clingy or close. Redirect into a command then reward. Get a good amount of appropriate chew toys and make sure there are a few present in every room.. Practice asking and rewarding Annie for going to Tahoe (her dog bed). Practice the recall exercise multiple times a day (less than 2 min per session) for the next 2 weeks. Increase distance and distractions when practicing the come. Practice answering the door with Annie staying on the top step at least one times a day for the next week. Call or text one another when coming home or invite friends as guests to practice. Add structure to the feeding ritual.